As a dog lover it’s not easy to get used to the “fur issue” that is constantly a part of your home no matter how hard you try to keep it under control. During the shedding season it can become almost impossible to keep the fur from flying in all different directions around the home when you try to dust or vacuum. It’s also challenging to keep your floors clean when your canine family member drags dirt and grass from the back yard into your home. People that visit you, however, will notice this and it may make them feel uncomfortable. While many dog owners would say that their home is for the comfort of their dogs and if people don’t like that, they needn’t visit, it’s nice to have your home tidy for guests to enjoy. You’ll need to keep up with the routine cleaning chores to maintain your house in relatively decent shape. Things like sweeping, dusting, vacuuming and mopping the house will need to be done regularly. It might be worth investing in a higher-end vacuum cleaner that has a spinning brush to capture all of the fur that gets entangled in the carpets. 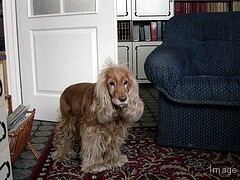 The more expensive units have longer and tougher bristles that can help work the fur out of the rugs. These vacuums also come in handy if you have a flea problem since the suction is usually better than what you’d find in the lower-end cleaners, and will help to get rid of the fleas in your carpet. One thing that I have found to be true is that the smell of dog is hard to completely eliminate in a home. Quite frankly, that doesn’t really bother me either. I love my dogs and don’t mind how they smell. It’s like a trace of “eau de doggy” and while it can be temporarily masked by air cleaners or purifiers it’s pretty difficult to make it disappear completely. If you have young dogs that aren’t yet potty trained or elderly dogs with incontinence issues, your home may smell like urine. Any messes should be cleaned up promptly and you’ll need to use an odor neutralizer to get rid of the smell completely. You know how your dog smells when it gets wet, and this type of odor can linger in the air for a long time. Bathe your pet regularly and dry him off well after his baths to keep the doggy smell to a minimum in the house. The cleaner your dog is kept, the less offensive odors you’ll have to deal with in the house. While you’ll always do your best to keep your home clean, there are certain things that your guests will just need to deal with if they are going to visit a dog lover. Perfection is not something that you’ll be aiming for when it comes to the cleanliness of your house when you have a lovable little dog living there with you. Susan Wright is an experienced veterinarian, dog fence expert, and freelance writer. To learn more about Susan’s work and the products Susan represents visit dogfencediy.com.